Artists from the Women Create exhibit now at Jamestown’s 3rd on 3rd Gallery will celebrate SWAN (Support Women Artists Now) Day on Saturday, March 31 by teaching a variety of workshops. One of these, Pencil Portrait Workshop, will be presented by Barbara Fox, a nationally recognized water colorist who teaches all over the country and designs for the U.S. Mint. 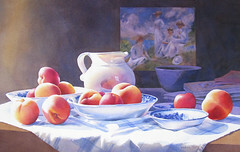 Her “Sweetness and Light” pictured here is part of the Women Create exhibit currently at the 3rd on 3rd Gallery. Jamestown, NY – Distinctive workshops by accomplished artists will be among the offerings when Jamestown, New York, joins the international celebration of SWAN (Support Women Artists Now) Day on Saturday, March 31. Using Your iPhone to Create Beautiful Photos – Jamestown artist Catherine Panebianco will show how your iPhone can produce art in a fun, creative way. Participants must have an iPhone and active iTunes account to purchase apps. Tech-savvy children are welcome. Fee: $15. Maximum enrollment: 12. Hands-on Fabric Painting – Panama artist and poet Kathleen Tenpas will lead participants in creating several squares of fabric using different techniques with Setacolor fabric paints on 100% cotton. Interested children age nine and older are welcome when accompanied by an adult. Fee: $25. Maximum enrollment: 12. Pieces of You: Harmonization through Collage – Under the direction of Cheektowaga artist Kaitlin Frisicaro, participants will rip, re-act, and layer colored paper and paint while focusing on creative composition and meaningful juxtaposition. Interested children age 10 and up are welcome when they come with an adult. Fee: $20. Maximum enrollment: 15. Introduction to Japanese Traditional Painting – A native of Japan, Edinboro, Pennsylvania artist Hiromi Katayama will share traditional Japanese pigments and techniques which she employs in her own artwork. Interested children are welcome if accompanied by an adult. Fee: $25. Maximum enrollment: 15. Image Transfer – Under the direction of Toni Kelly of Erie, Pennsylvania, students will experiment with at least five different transfer methods using acrylic mediums and rubbing alcohol and a new transfer method that does not require any mediums. Transfers will be made onto paper, fabric and canvas. Interested children age 9 and up are welcome if accompanied by an adult. Fee: $30. Maximum enrollment: 15. The workshops will be held at Infinity Visual and Performing Arts, 115 East Third Street, and the Arts Council for Chautauqua County, 116 East Third Street, in downtown Jamestown. For details and examples of the instructors’ work, click on Workshops on the SWAN Day page at https://womencreate.wordpress.com. Interested participants are requested to pre-register by Friday, March 23. Walk-ins will be welcomed only if there is room. While children are welcome as noted with each workshop, their fees are not discounted. A registration form is available on-line at https://womencreate.wordpress.com/swan-day-2012/workshops/. For details on all the SWAN Day activities, including an Art Market and closing exhibit reception, visit https://womencreate.wordpress.com/.